Back in November, I noticed in Hamels newsletter that the ladies from The Quilt Patch in Moose Jaw, Saskatchewan were coming to do a trunk show and teach a class. I quickly asked Santa for the class for Christmas(thanx Santa!) and waited for the weekend to finally arrive. Friday morning, a massive power outage shut down our town. 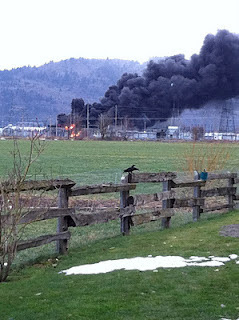 A fire at a hydro substation had the hydro company turning off the electricity. Should I mention that Hamels store was a mere distance away from the fire. This picture is from the backyard at Hamels Quilt Store. Thankfully, power was restored and the fire was out; the weekend was a go! Friday night was the trunk show. 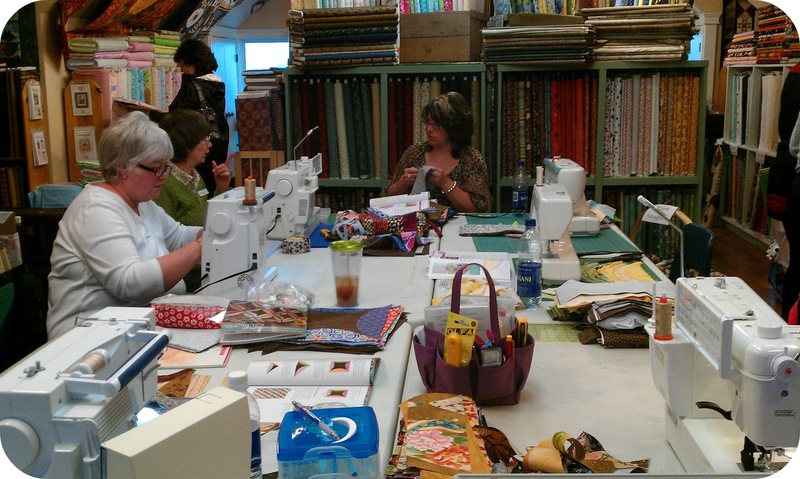 Our class with Shelley instructing. One of 3 blocks I completed. The class has A LOT of cutting. Other goodies I brought home. 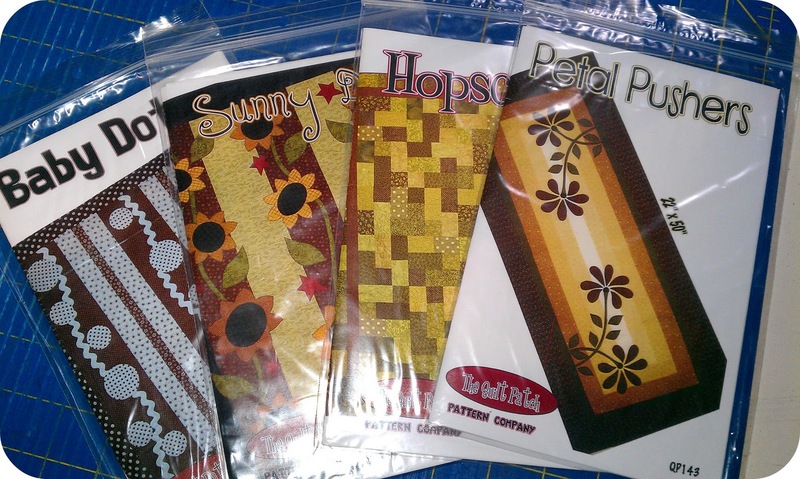 I have some sewing to do! 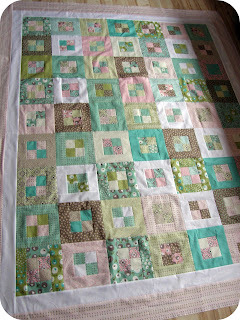 The boy quilt to match the girl quilt from last week. Originally I didn't plan on making the quilts from the same pattern(yellow brick road), but the first boy quilt I did, I wasn't thrilled with how it compared to the girl quilt so I did this one up. The two quilts look so different from each other. I wish I had been able to take a picture of the two of them together. 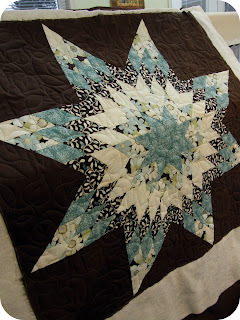 My favorite part is the backing; I love how the quilting shows up. I had a fabulous time at my class on the weekend. Come back tomorrow and see what I got accomplished. Beat butter, sugars, eggs and vanilla for 5 minutes. In another bowl, combine oats, flour, baking soda, baking powder, and salt. Add to butter mixture 1 cup at a time. 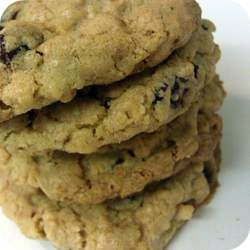 Mix in raisins and craisins. 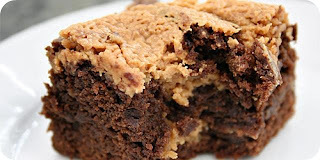 Drop by spoonfuls onto greased cookie sheets and bake for 12-14 minutes at 350 degrees F (175 degrees C). Enjoy!! 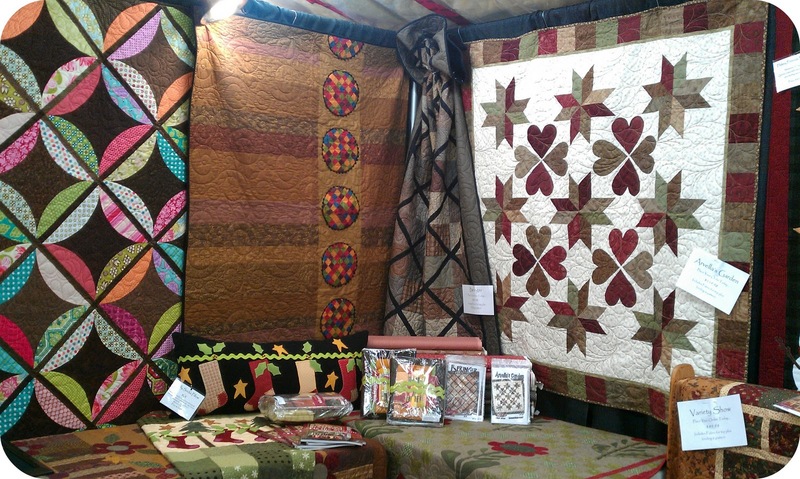 I'm going to a trunk/mini quilt show at Hamels. The guests of honor? 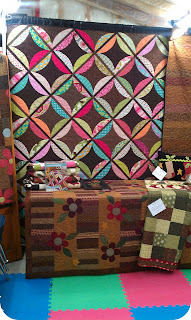 Shelley and Jeanne from The Quilt Patch. And tomorrow I'm taking a class with Shelley and Jeanne and making the following quilt. and almost all my shapes traced out. That January is almost over? With last week off because of the snow, it really feels like the start of the new year this week; instead of 3 weeks ago. But still, February is on Wednesday; WEDNESDAY peoples; how is that possible?? Anyways, back to work; have some lovely quilts in right now I am looking forward to quilting up. One of the customers I always look forward to seeing is Kathy. 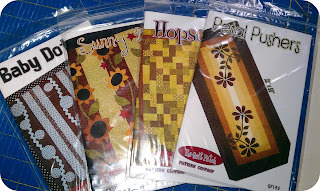 Kathy brought these 3 in; she always picks the funniest fabrics and modern quilt patterns. How cute is this fabric? 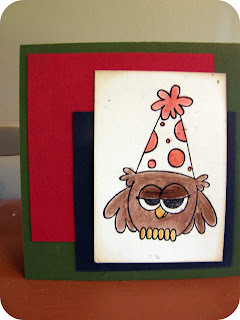 I can't decide which print I like more; the owls or the fun circle print. 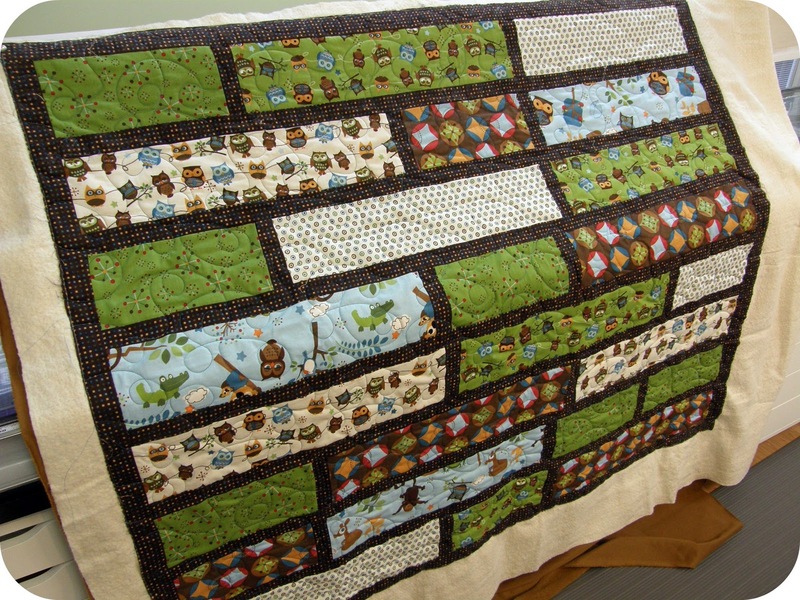 Perfect choice for a kids quilt. 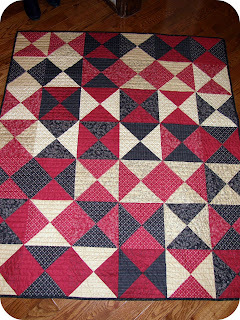 Kathy made an identical quilt last summer; all lovely flannels. 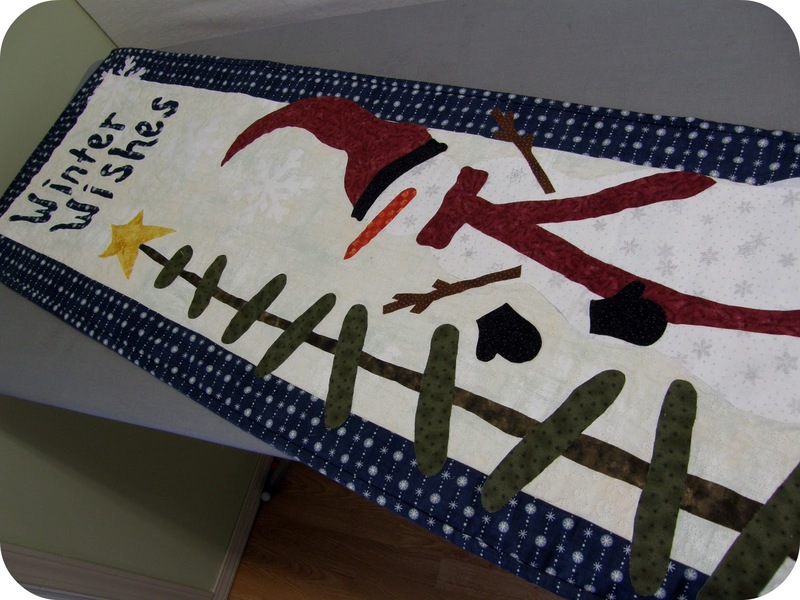 Kathy took a class at a local quilt store and made this last quilt. 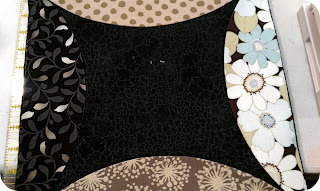 The Habitat line is one of my current favorites right now; I'm using it in two different projects. I love this wall hanging. Now it's time for me to get to work; have a great Thursday! My computer is on it's last legs. I could use my notebook to blog but I hate the picture editing program on it and honestly, just too lazy to figure it out lol. It takes FOREVER to do a blogger post(I've been working on this one now for 45minutes), frustrating!! 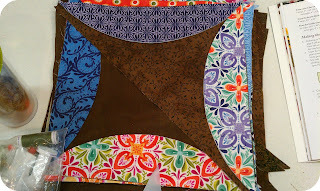 I'm also frustrated with my 4patch quilts; they are seeming to take forever as well to finish up. I got the tops completed on Saturday and now I have one left to get the borders on. I will say that they sure look great. 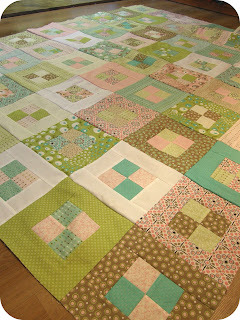 The quilts are identical except for the borders; one pink, one teal, one spring green. 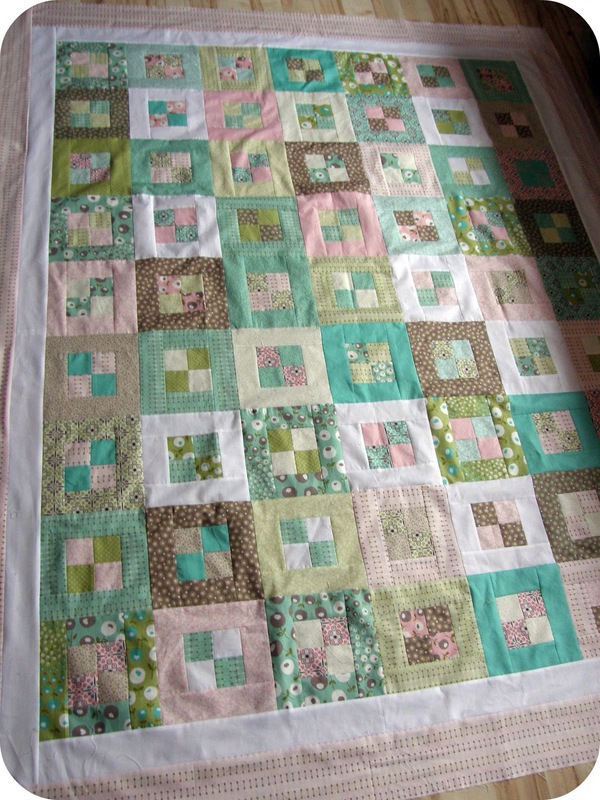 The baby quilt also has a spring green border. 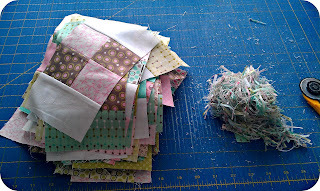 I have enough blocks to may one more baby quilt; it will have a scrappy border. It will be a while before I'll want to work on that one lol. I do have something exciting to show you. 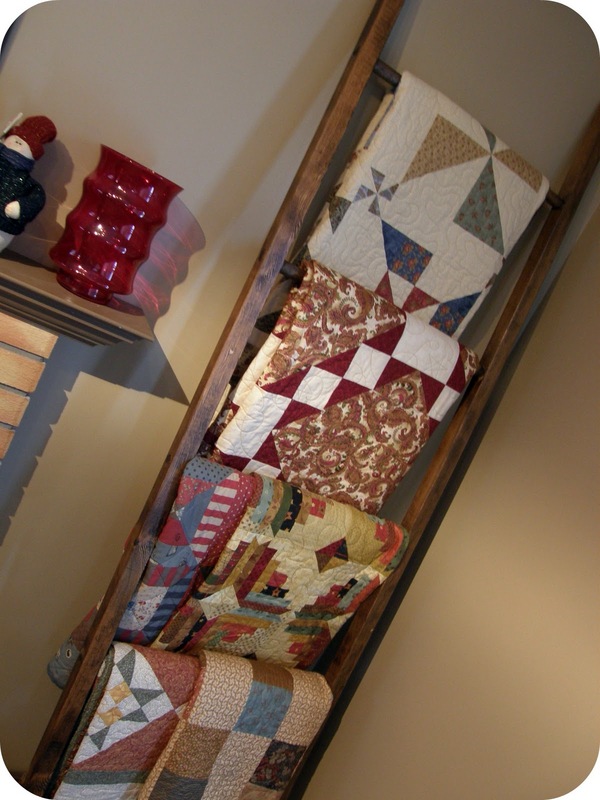 I asked for a quilt ladder for my birthday this year. Once Jim got it finished, we had the Christmas tree up and couldn't put the ladder up. It's finally up now and I loves it so much. 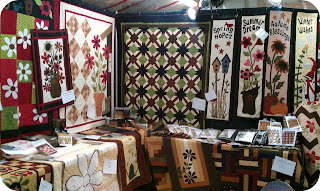 I love that it's another way to display my quilts in a way that people can see them. Thanx Jim! Now I think I'll go work on some borders. In large bowl beat 1/4cup of peanut butter, the butter and sugar. Add in eggs and vanilla. Beat in chocolate. Spread in a parchment lined 8x8 pan. By spoonfuls, drop remaining peanut butter over the top. Run knife through the batter to swirl, smooth the top. Bake at 350* for about 20minutes. 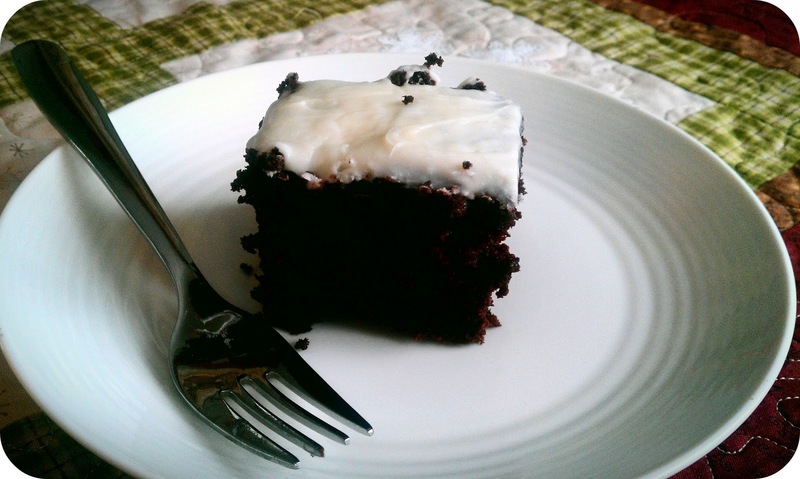 Let cool and cut into squares. 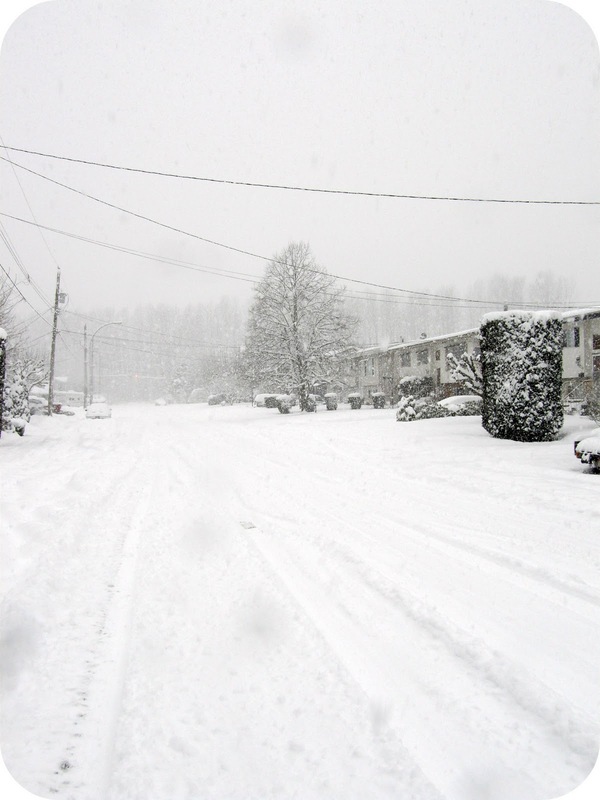 Overnight and tomorrow morning we are expecting more snow. 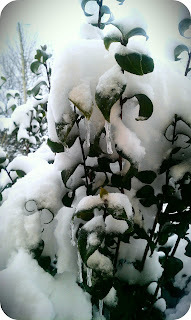 Yesterday was a mess with freezing cold temperatures and wind. The blowing snow was so bad that most of the roads around here were closed and the city was asking people to just stay home. 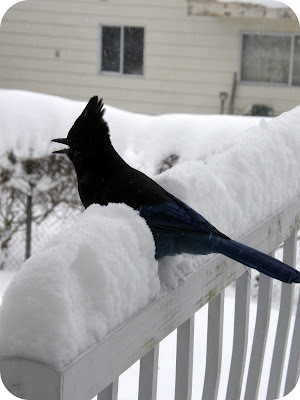 Overnight we are expecting more snow and than freezing rain tomorrow. Not looking forward to that. I doubt we will have school tomorrow; it's almost why bother for one day at this point lol. Today I took a break from my 4 patch quilts and finished up this cutie. I did a stipple in the white background, echoed inside the star, the hat, scarf and mittens. In the snowman body, I traced the snowflakes in the fabric. Tonight I'll embroider on the *string* that attach the mittens together. I was fiddling with my computer today and found a special Christmas present that I hadn't blogged yet. 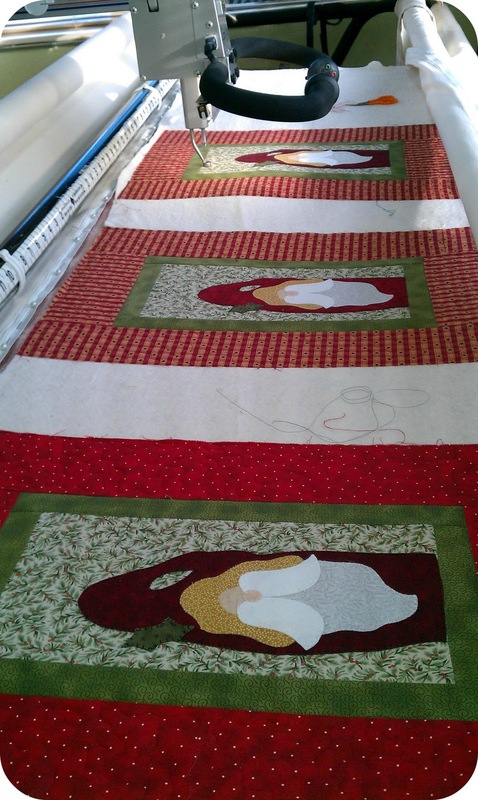 Mom and I made 3 Christmas lap quilts for the 3 pastors at our church for Christmas. 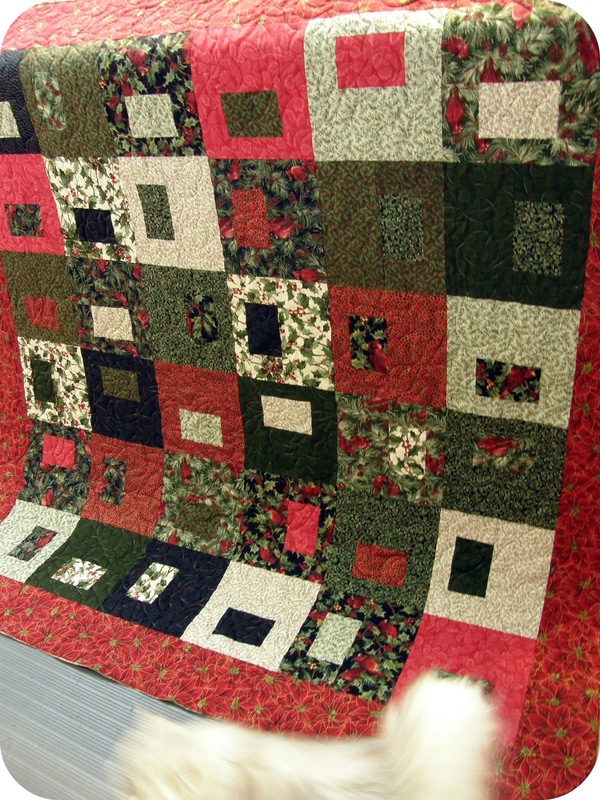 We spent a Saturday piecing the tops than got them quilted. 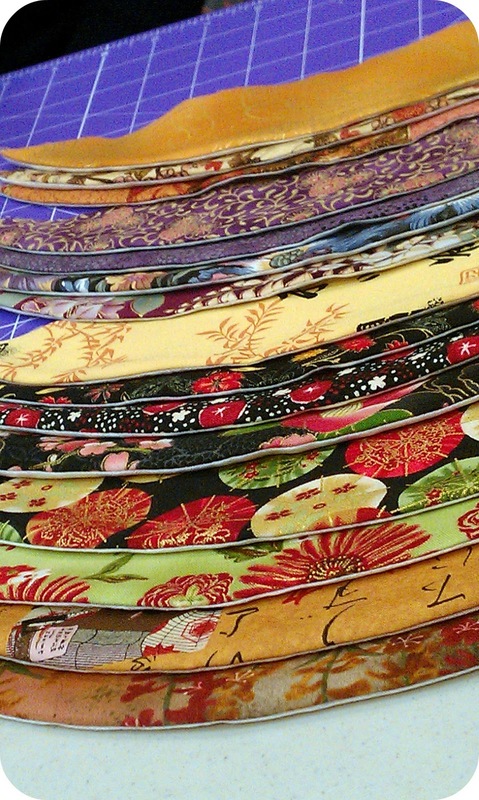 We both spent Christmas Eve day frantically sewing the bindings to get them finished up. 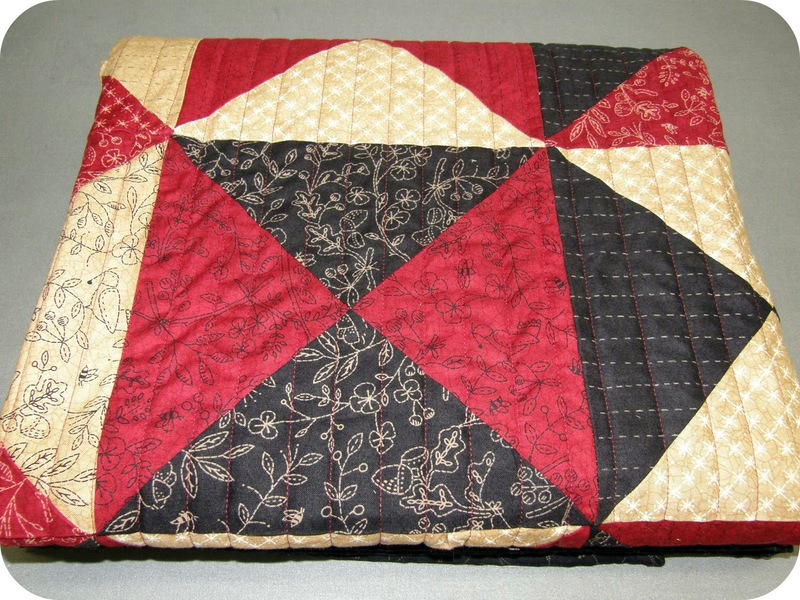 This is the one I quilted. It was for our senior pastor. 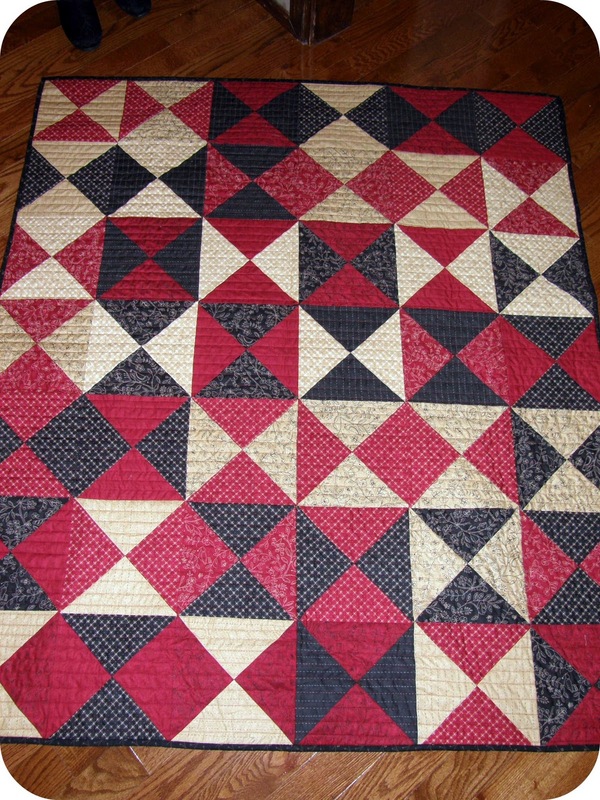 We used a fat quarter stack of fabrics so each quilt was similar except for the borders. 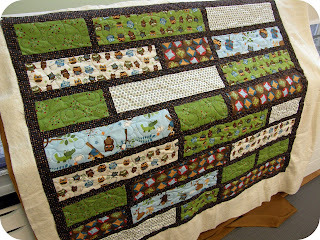 You can check the rest of the quilts out at mom's blog here. And the snow continues. Loving this! Today along with the snow, we have arctic outflow cold; currently our temp is -12*C(9*F) and the wind makes it feel like -24*C(-11*F); that's brisk!! School was closed again today and believe tomorrow will be another snow day as well. And it is oh so very very pretty out! 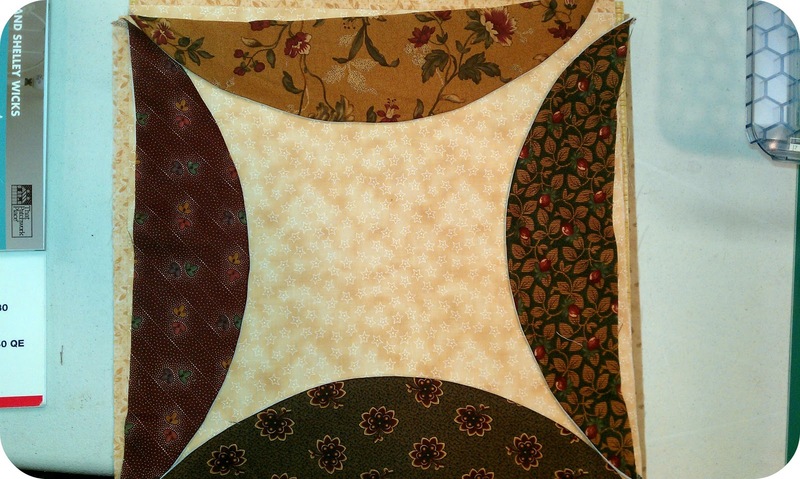 I spent the morning squaring up lots of 4 patch blocks and by bedtime tonight, hopefully have at least one of four quilt tops finished. Unless I get pulled into another Monopoly game marathon that is. 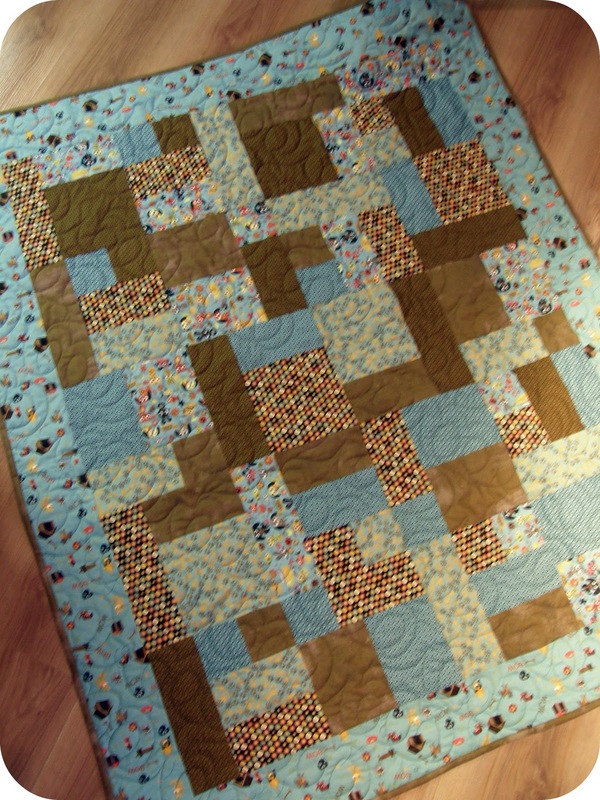 My first commissioned quilt of 2012. I blogged about the boy one here. I absolutely love this line; so soft and beautiful. Perfect for a new baby girl. Lily and Will fabric. 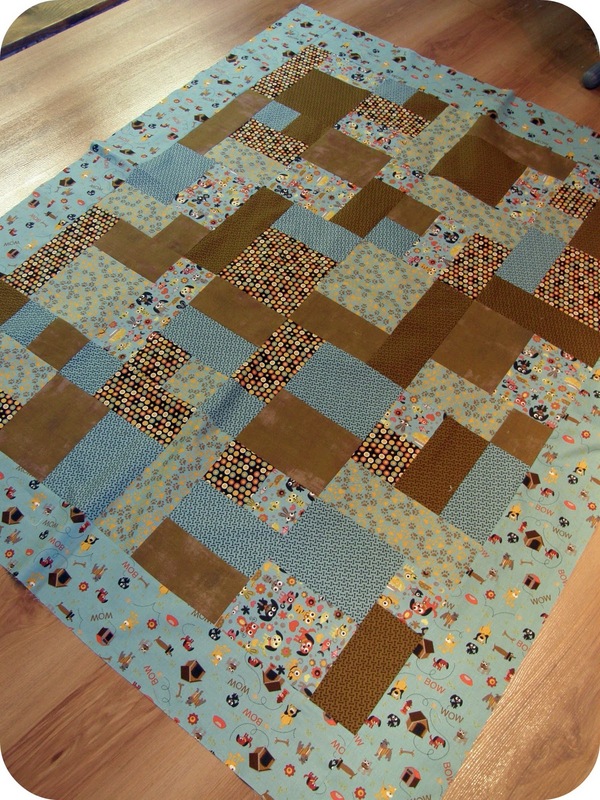 Yellow Brick Road quilting pattern. Hope the new mom loves it as much as I do. 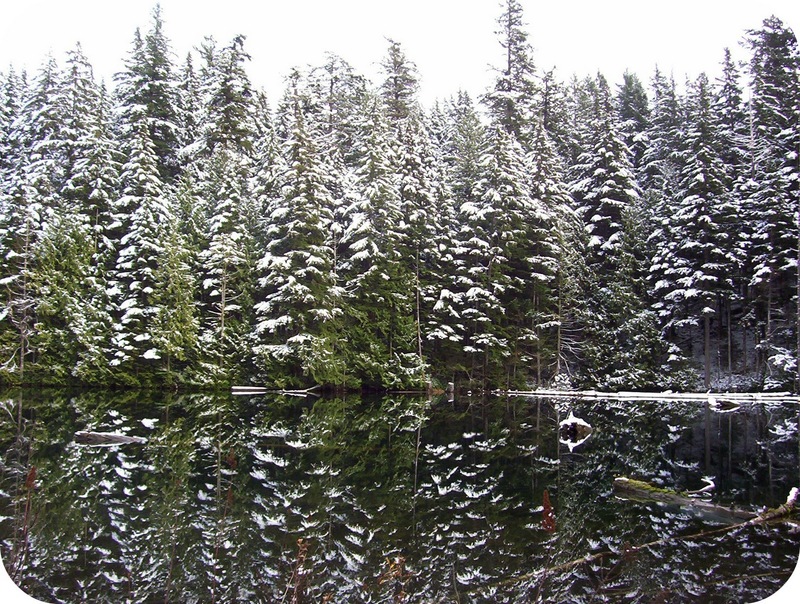 Even though we live in Canada, where we are(southern part of British Columbia. 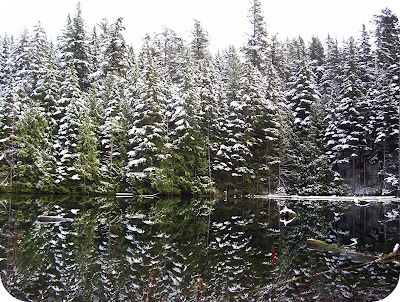 only 3 hours north of Seattle), we don't see a lot of snow. And when we do get snow, it's wet, heavy and usually melts in a few hours. Until this weekend. All last week we were hearing of winter finally arriving. Temps here have been warmer than normal(around 10*C which is around 50*F). This weekend we hovered around 0*(32*F) and today it's been -5*C(23*F). 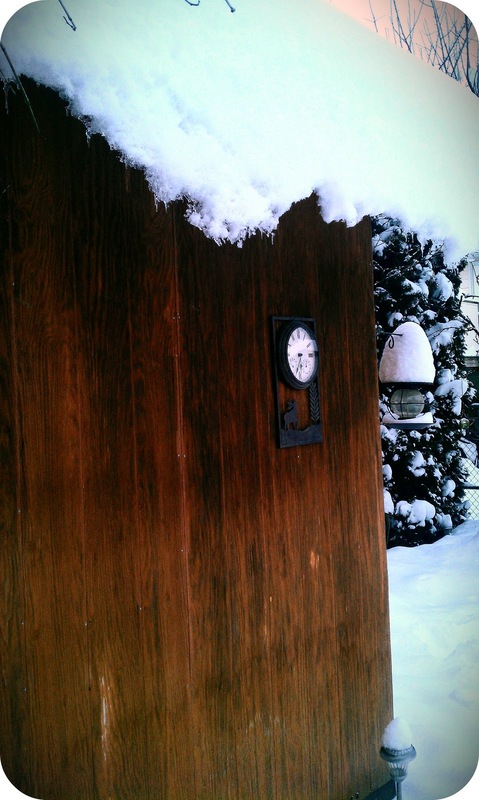 And the snow came. It arrived Saturday; we got about 4 inches and the kids played. Sunday was beautiful; blue skies, a few flakes and the kids played. Beautiful huge fluffy flakes. Lots of dry light powdery snow. Just before lunch, we had 10 inches measuring in our backyard. And it's coming down fast enough that our driveway can use another shoveling already. So it is the perfect day to finish off these little quilties. I had some free time Friday afternoon at work and got these quilted up. Now all we need is a Christmas tree ! Mix first 4 ingredients. Add the cocoa and mix well. Sift remaining dry ingredients and add to mixture alternating with milk. Pour into greased pan (9x13). Bake at 350*F for 25-30 minutes. 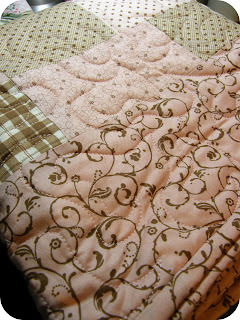 In the fall, I was asked to make two baby quilts, one in pink and tan and the other blue and tan. I knew I had to go with Lily and Will for the pink/tan quilt. But for the blue/tan? 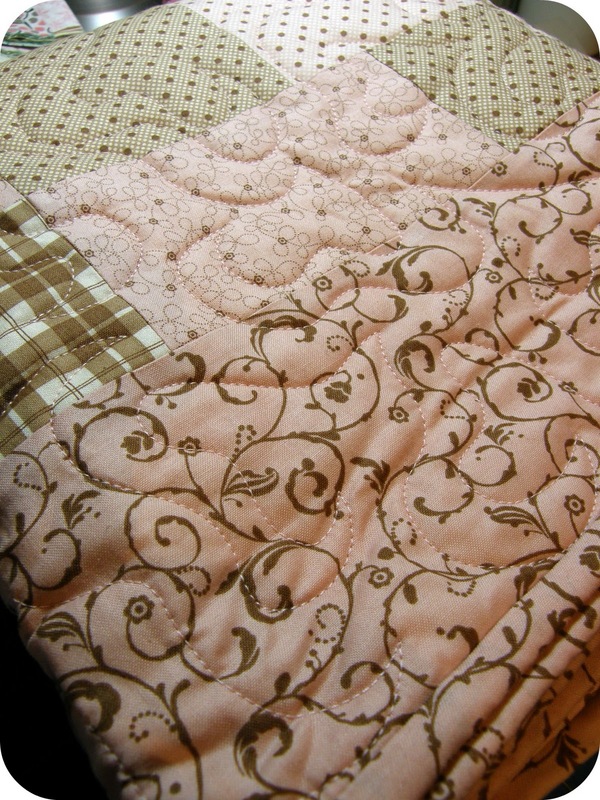 I had some Pure fabric left but once I had the quilt together, it didn't have the same impact as the pink/tan one. 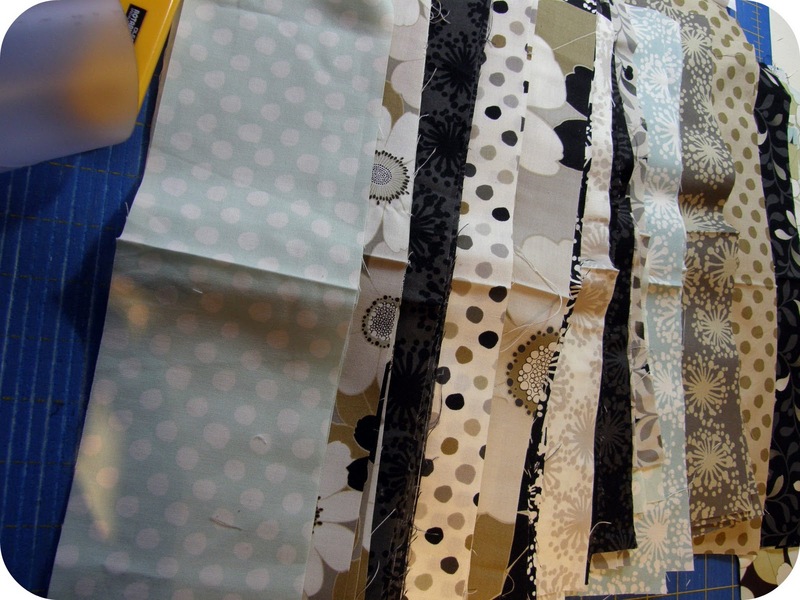 So a quick trip to Hamels and I had some fabric. For some reason, I didn't take a picture of the other quilt and it's at work ready for quilting. There were 3 sweet little babies born into our family last year. 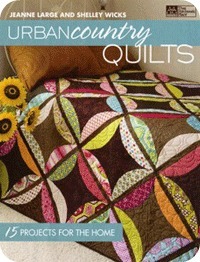 And I didn't get a chance to make some quilts for them. 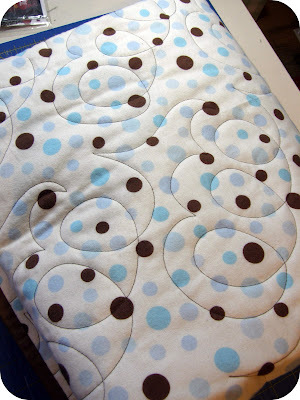 One of the babies is now a big sister and I knew I had to get some quilts done. 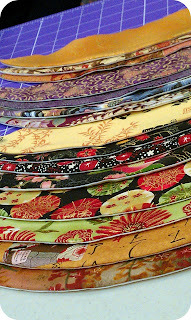 I hit a fabric sale and gathered some jelly rolls and yardage with the plan to make 3 twin quilts. 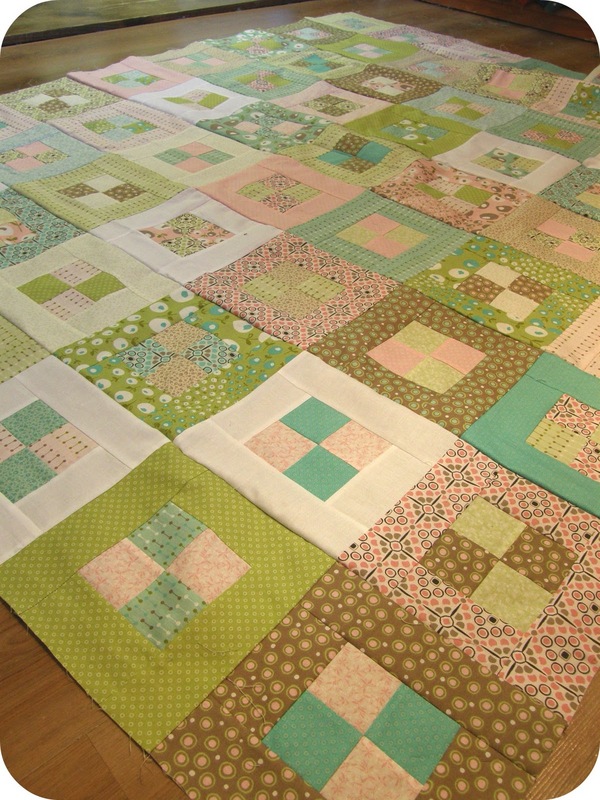 Well, somewhere along the line I miscounted and I have enough blocks for 4 twin quilts AND a matching baby quilt. The back-up plan quilt for my sister in law for Christmas. You can read why it's the back up plan here. Lucky for me, Erica loved it. 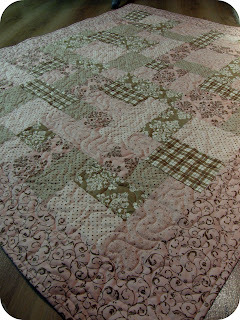 And I love it much more since it's been quilted than I did when I first made it. Pieced from a layer cake of Full Circle. 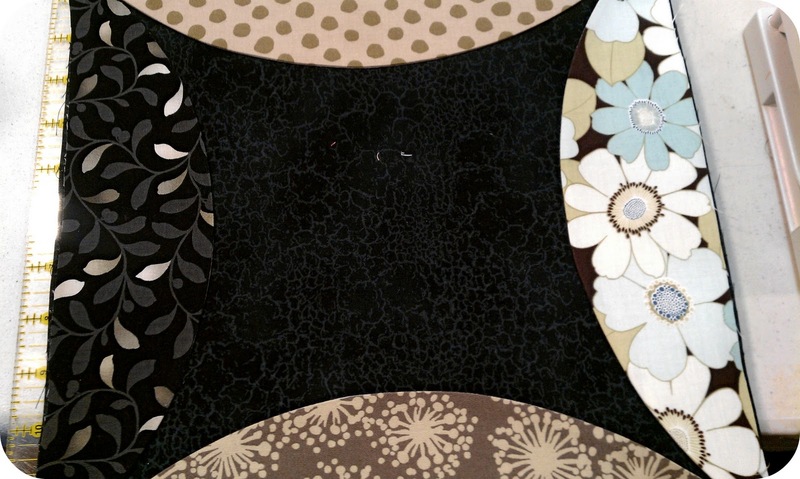 I loved this line online but once I got the fabric, not so much. It sat on my sewing table for months; one night I decided to sew it together just to get it out of my sight lol. And the back up plan was born. 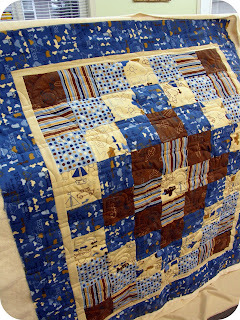 Quilted simply with straight lines, they brought the quilt to life. Today is my first day back to work. I got so much accomplished last week with my week off; can't wait to show you! Filling: Place the apple chunks in a large bowl, along with the berries (if using) and lemon zest. Toss with the lemon juice and sugar. 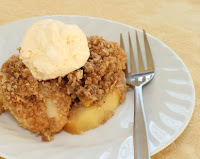 Transfer to your prepared baking dish Spread the topping evenly over the apples. Bake for approximately 30-40 minutes (20- 25 minutes for individual ramekins) or until bubbly and the topping is golden brown. (If you insert the tip of a sharp knife into a chunk of apple, it should be tender, not mushy.) Remove from oven and place on a wire rack to cool for about 30 minutes before serving. I have a very large snowman collection. So large that once the Christmas decorations go away, the snowman come out for January. I did some furniture re-arranging before Christmas and as a result, ended up with an empty space on the wall. A big empty space. Well, that just won't do! 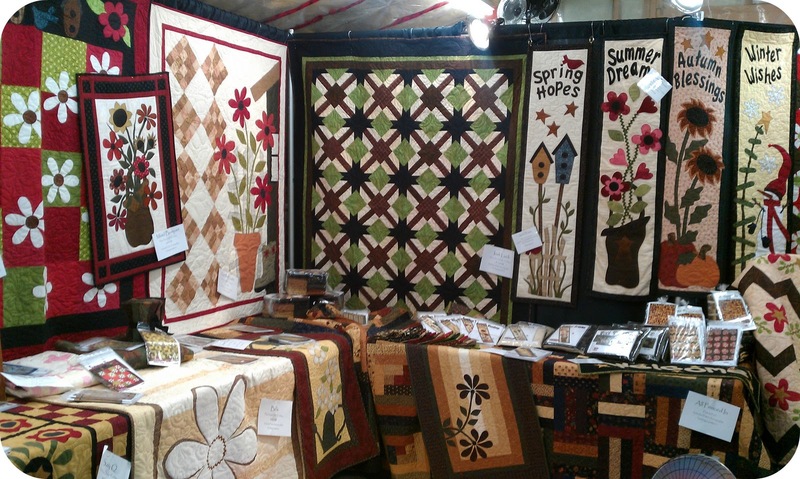 I spent some time going through some quilting magazines to see if I could find something that I could whip up quickly and get on the wall and nothing. Than I had an idea of something. 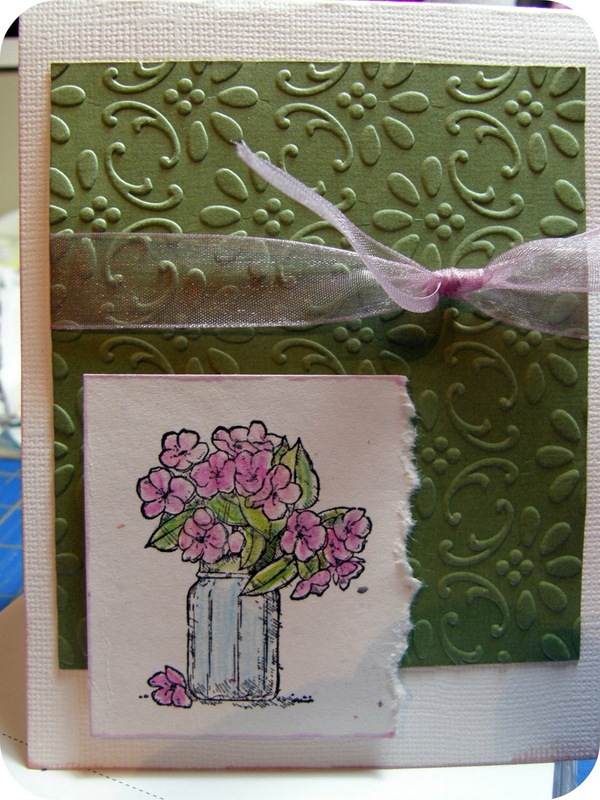 I started pulling some scraps and began cutting. And in the end, I ended up with nothing close to what I had originally planned(isn't that always the way? lol). It's not very big, about 45 by 50ish. The snowflakes are what I was supposed to put on Mom's Christmas present. I couldn't be happier with it. 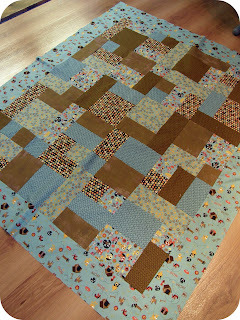 So simple; just randomly sized strips sewn together. 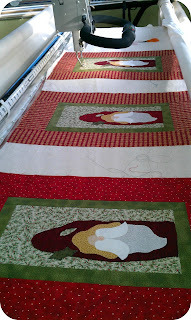 I than measured the wall space and decided how big the border should be and cut the strips shorter. I love the borders on just the two sides. I just have to decide now if I want to bind it in white of the snowflake border print; I'm leaning toward the print as I am simply in love with it. 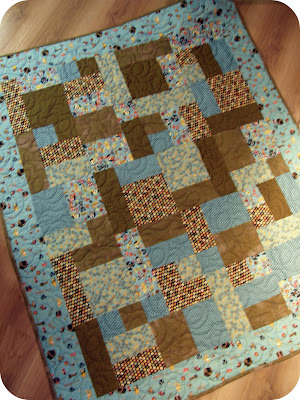 This is also my first quiltie finish of 2012. I would say I'm off to a pretty good start. This year marked a first for me; for the first time, all my Christmas cards were made with Stampin Up stamps. It wasn't planned that way, it just happened. I love this stamp. You can't see it in the picture but I added some glitter to the snowflakes in the antlers. So simple and pretty. 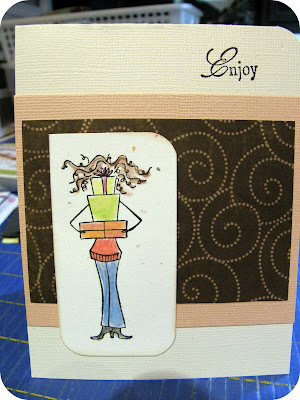 This one is based on a card I saw in the Stampin Up catalogue. It was my warm-up card and I think it turned out fairly decently. I also made these cute gift tags. This card I'm not happy with. 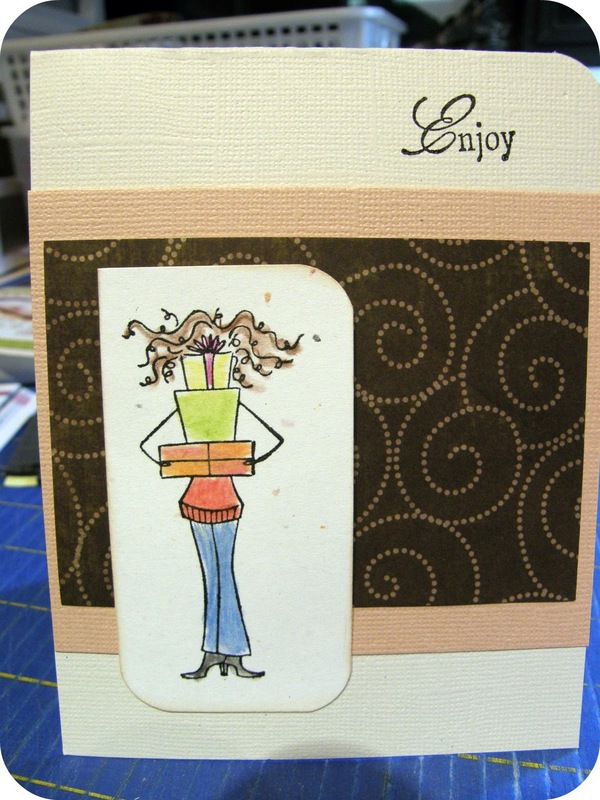 We were playing with the Simply Score tool at stamp club to make this next card. I cut my paper too narrow and was determined I would make it work. It may have if I had used enough adhesive and the rosette stuck properly to my card lol. I think it's still a cute card, even if it's wonky lol. The boys are all back to school today; I find it weird that we started back on a Tuesday. It's feeling like a Monday and I think my whole week is going to be a day off lol. 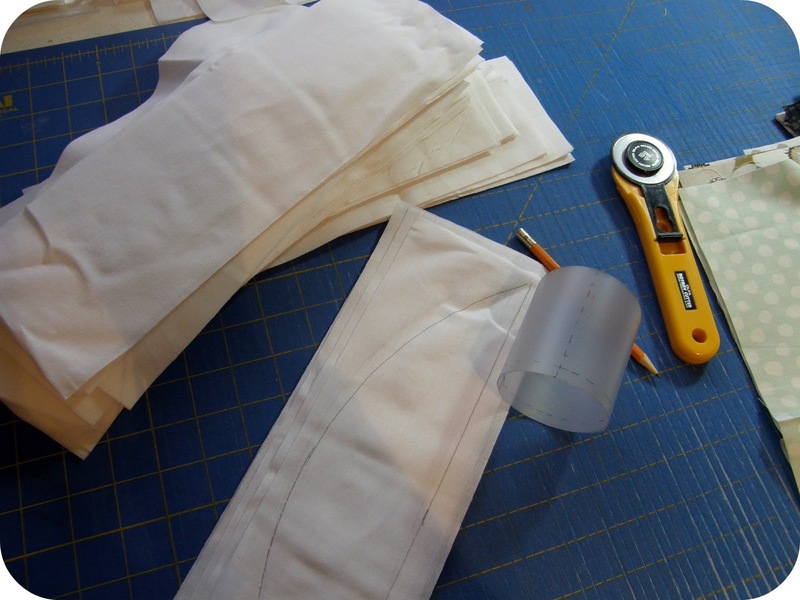 For now, it's back to the sewing room!